Yeah, this is one of those times. In a wonderful post about a month ago, Jay Acunzo of NextView Ventures wrote about “segment thinking” in content marketing. But then, as they say, something funny happened on the way to the forum. In the discussion that followed, Jay and others moved the conversation into how “intelligent content” is defined. 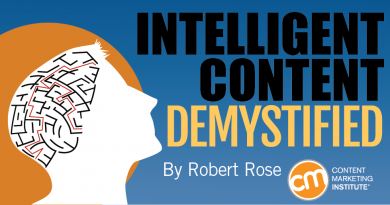 It culminated in some great suggestions for new names for intelligent content, including my favorite, “recombinant content,” coming from the incomparable Doug Kessler. ….that definition [of intelligent content] is still pretty dense and confusing. What IS it? Is it technology? Is it an approach? Is it a collection of reusable assets … Is it like content strategy, which is the tagging system and “back end” of your content on your website? If Jay has these questions – others do as well. So, having straddled the worlds of intelligent content and content marketing for the last 10 years, I’d like to demystify intelligent content with this step-by-step practical definition of intelligent content. In very simple terms, and to answer Jay’s question succinctly, intelligent content is an approach. Intelligent content is the approach of thinking through the way we structure (organize) and manage content – so that it can be managed as a strategic asset. If you are new to intelligent content or still struggling with its definition, this post briefly breaks down each element in the definition so you can better understand what it is and see an example illustrating each element. But, read the SlideShare version in its entirety for bonus information such as things to remember for each element. 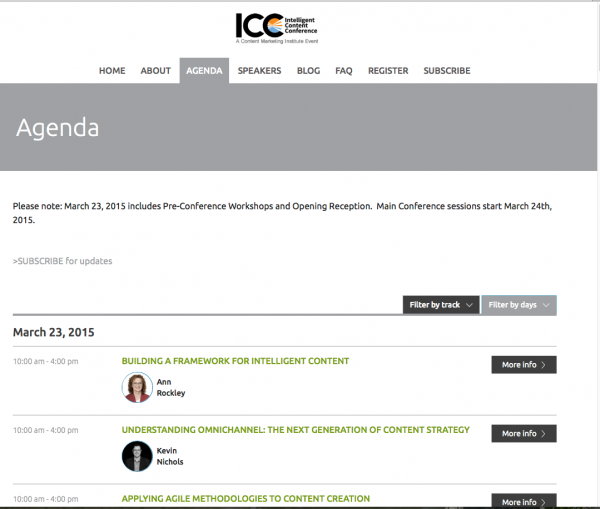 What makes intelligent content intelligent? Intelligent content is structurally rich and semantically categorized and therefore automatically discoverable, reusable, reconfigurable, and adaptable. What does each term mean? Let’s take a look. Structure comes first. Structure – consistent organization – enables automation. And strategic automation makes content intelligent. To make your content structurally rich, “you need to remove formatting (look and feel) from source files and add structure: predetermined organizational patterns supported by metadata tags,” Rockley says in What Is Intelligent Content? Content elements like these are not, in themselves, intelligent. But combined with skilled content engineering and a solid strategy, they lend themselves to intelligent uses. “Semantic” means “related to meaning” (as opposed to “related to appearance”). Semantically categorized content is associated with metadata – information about the content. Metadata enables computers to do things they couldn’t do otherwise, like retrieve content related to a product even if the content never mentions that product. Metadata tags enable people to organize digital information in nearly limitless ways. The key is to organize in effective ways, using categories that serve both the organization and its customers. Let’s take two content elements from the example: the speaker’s name and photo. The metadata tags shown in brackets – name and photo – are semantic categories. “Automatically discoverable” means able to be found by computers. Digital content that computers can’t find might as well not exist. Findability goes beyond web search. For example, an employee might want to search an internal repository to assemble documentation for a certain user type and product model. In that case, the metadata must enable the system to find the right pieces of content for that audience and purpose. People discover conference information in many ways: They may search for speakers’ names, topics, etc., using a website’s own search engine or using an external search engine, like Google. The better the metadata in the source content, the better the search experience. Content reuse is “the practice of using existing components of content in multiple ways,” as Rockley describes it. Well-structured, semantically rich content can be easily retrieved, manually or automatically, for reuse. This kind of reuse strategy is sometimes called COPE: Create once, publish everywhere. 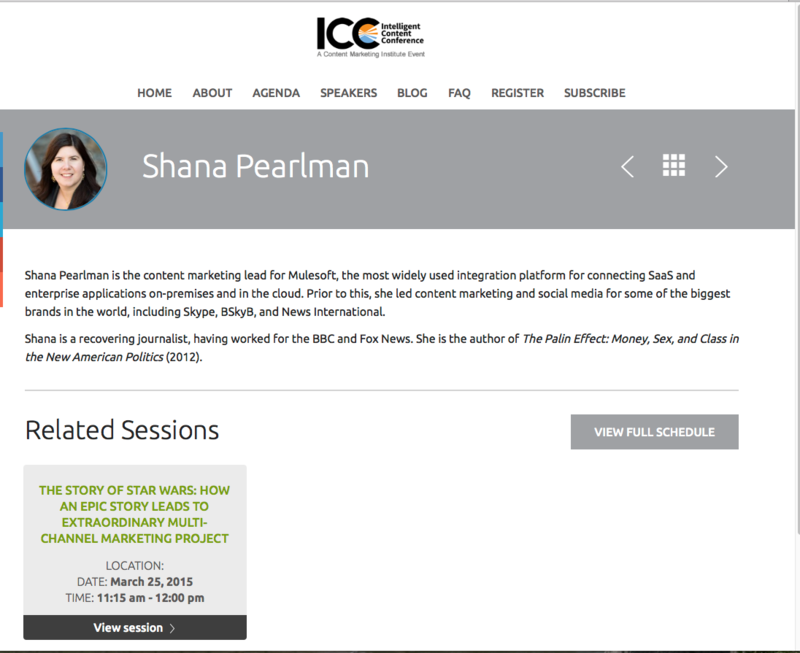 Every ICC speaker’s page displays the presenter’s name, bio, and presentation title, date, and time. These elements were not copied and pasted onto this page. Each element is re-used – automatically pulled from a single source. The photo is stored in one place, the speaker’s name is stored in one place, and so on. 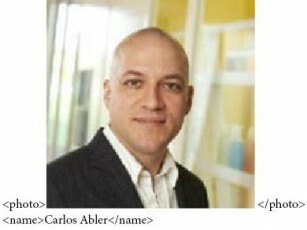 If you change a photo, name, or presentation title, you change it at the source; that change appears everywhere. On a small scale, this kind of efficiency is nice to have. On a large scale, it’s mandatory. When content is not set up for reuse, it gets messy fast. Well-structured, appropriately tagged content can be assembled – configured and reconfigured – in various ways. 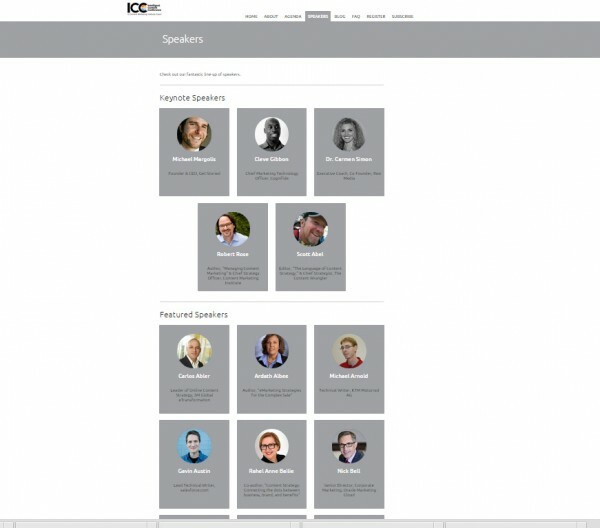 On the ICC Agenda page, elements that we saw configured elsewhere in alphabetical order by speaker name are configured here in chronological order by presentation date and time. Adaptable content, usually called “adaptive content,” is content that can change (adapt) – not just in appearance but in substance – according to the person receiving it, the device receiving it, the channel, the time of day, the location, or other circumstances related to the context of delivery. Delivery may vary based on what the system knows about the recipient (age, recent search phrases, social media connections, book purchases, etc.) or the context of use (day of the week, time of day, device location, etc.). For instance, let’s say you create both a long and a short description of a content element. The long description is automatically delivered to laptops. The short description is automatically delivered to smartphones. Adaptive content goes beyond responsive design. The content itself changes according to the device, the recipient, or the context of use. Imagine the way search results might be adapted for you if the information system knows that you’re vegan, attending ICC, using a smartphone, and moving at a walking pace just outside the conference hotel on Monday around dinner time. If you search on the term “restaurant,” imagine getting the name of an eatery just around the corner that’s open now and serves vegan fare. That’s content adapted to your preferences and situation. I’d like to admit I am scared. I am scared because the majority still has trouble with basics of (content) marketing . . . Intelligent content, content marketing, content strategy … It’s like us adding new stuff, it’s like a small group debating and enjoying the debate, and there’s the rest of the world. Intelligent content is not about ruining content by making it unnecessarily complex just for the cool factor. It’s about making content more complex because *the market* is more complex than it used to be; and it’s becoming more so every year. Intelligent content exists to save content from getting ruined by a disconnect between content supply and consumer demand. In short, everything we are working on is tied together. I borrow from a post I wrote last year on how content strategy and content marketing strategy are separate, but intimately connected. All three disciplines (content marketing, content strategy, and intelligent content) share one common, inalienable goal: To foster content as the differentiating asset of the business – and thus content-as-a-function should be a strategic function within the business. Is intelligent content the best term? Maybe. Maybe not. That is an “inside baseball” discussion that doesn’t affect the outcome. To me, the importance of intelligent content is that it takes a different approach to the broader subject of content. It’s very much like the broader disruption going on in manufacturing between additive and subtractive manufacturing. Manufacturing historically has been a “subtractive process” where, for example, you look at a sheet of tin or steel and strategically subtract the best way to cut it to maximize the value. Using the “additive process” all that goes out the window. Now manufacturing literally becomes a process by which you can add (i.e., produce through three-dimensional printers) any part you need. In other words, the evolution of technology has enabled a completely new way to view how you construct and display an asset to maximize that asset’s value. It’s a grand adventure ahead. The search for intelligent content in the universe continues. Let’s go find what it all means together. I’m hoping that’s a helpful response to Jay’s excellent question. Want to continue learning about intelligent content and content strategy? Sign up for weekly email updates – including exclusive insights from Robert.